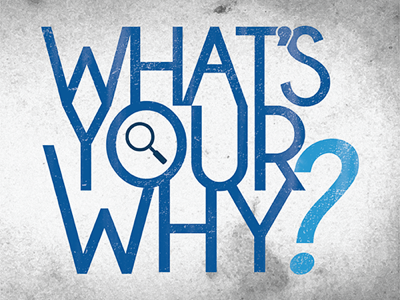 Have Your Lost Your “Why”? Entrepreneurs are a different breed. They are not cut from the same cloth as most. Truth is it takes A LOT of grit, adaptability, passion, patience and a crystal clear vision to be an entrepreneur. Once you do take the leap and follow your dreams there is always the chance that you will burn out and lose the passion that you once had- you have lost your why. Did any of these resonate with you? If so, then you need to return to your roots- you need to rediscover what your WHY is. Your why is your catalyst, your fuel, your business (and quite possibly your own) reason for being. Think back to your first lightbulb feeling. Relive the conversation that you had when you came alive with the idea of your current business. Here are some questions to ask yourself to help guide you along. What was it that you wanted to do or to give to others? Where were you when you KNEW that you HAD to start your business? Who was with you and what did you talk about? Why did you want to do or give this? If you did not do ________, what are people in this world going to miss by you not getting your message out there?